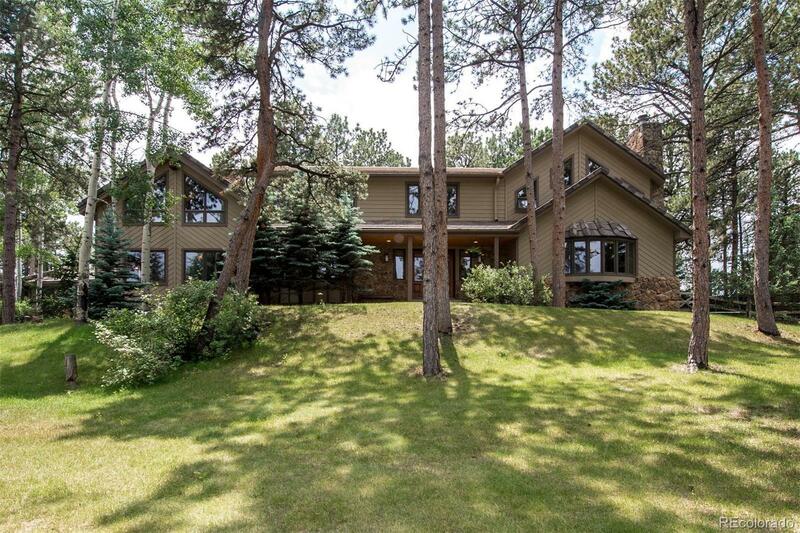 Stately, custom mountain retreat, nestled in the heart of Hiwan. Unique architectural details & rich finishes fill this very special property, creating a warm, inviting atmosphere throughout. The seamless layout provides ample spaces to relax, play and entertain. The professional kitchen is the heart of this home featuring Viking 6-burner/griddle/fryer, 3 ovens, full size Sub Zero frig & freezer, bar area w/kegerator, ice maker & wine frig, along w/breakfast nook & counter bar seating. It opens onto the back deck/yard which features an outdoor gas cooking center, gas fireplace, tranquil water feature, large open grassy areas for play, stone patio & new hot tub. The main level also includes a stunning great room, family rooms, formal living & dining rooms and a gorgeous den/study w/wood fireplace. Upstairs are 3 bedrooms, plus the spacious master suite & the lower level features guest quarters, 3/4 bath, movie theater, wine cellar, wet bar & two more flex areas. Plus many more features!